Waffle is a native C# and Java library that does everything Windows authentication (Negotiate, NTLM and Kerberos), on Windows - https://github.com/dblock/waffle/. Slides from my presentation here. Oh, and yes, if you’re still writing JNI code, stop and switch to JNA. 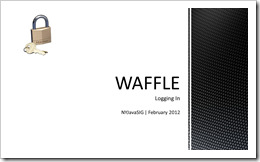 Waffle @ NYJavaSIG was published on February 24, 2012 . See a typo?